During the past 24 hours, solar activity was very low. There was one active region on the visible disk, without C-class and above flare produced. The solar wind speed maintained at about 350 km/s. The geomagnetic field was at quiet to unsettled levels. 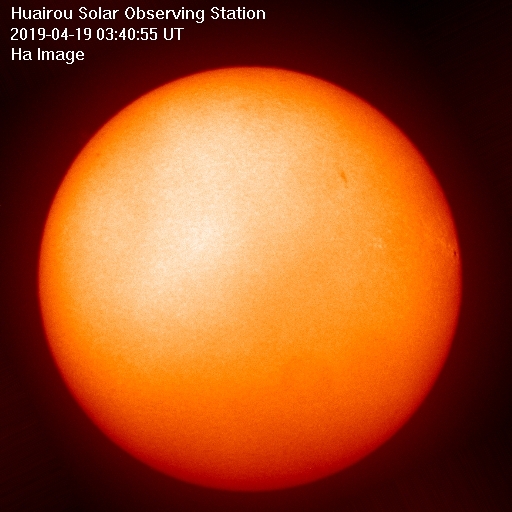 Within the next three days, solar activity is expected to be very low. The geomagnetic field is expected to be mainly quiet. During the past 24 hours, solar activity was very low. There was one active region on the visible disk, without C-class and above flare produced. The solar wind speed reached a peak value of about 400 km/s. The geomagnetic field was at quiet to unsettled levels. During the past 24 hours, solar activity was very low. 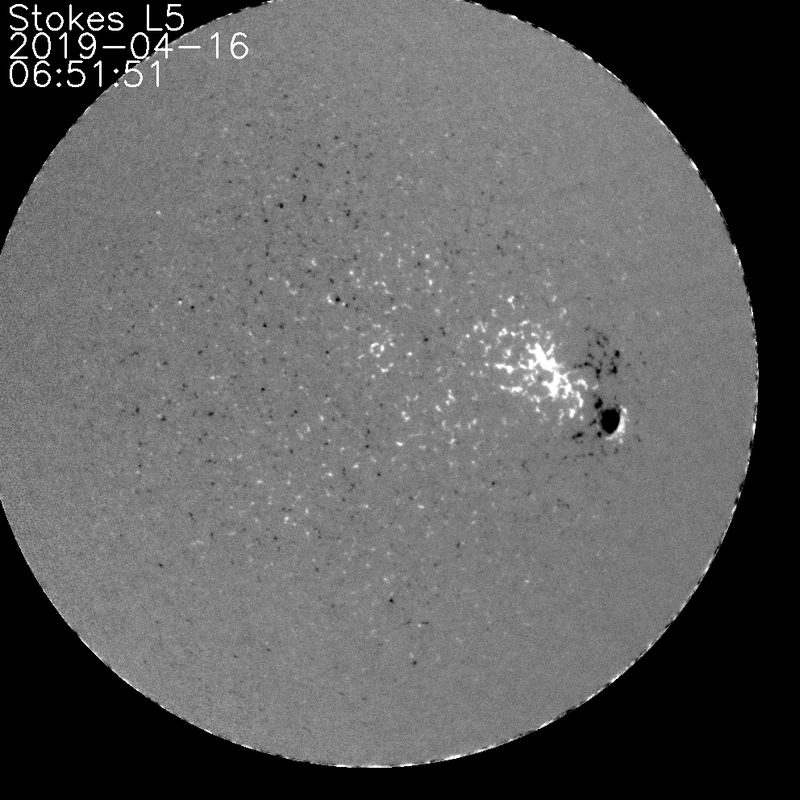 There were 2 active regions on the visible disk, without C-class and above flare produced. The solar wind speed decreased to about 330 km/s. The geomagnetic field was at quiet to unsettled levels. During the past 24 hours, solar activity was very low. There were 2 active regions on the visible disk, without C-class and above flares produced. The solar wind speed decreased to about 300 km/s. The geomagnetic field was quiet. During the past 24 hours, solar activity was very low. There were 2 active regions on the visible disk, without C-class and above flares produced. The solar wind speed maintained at about 320 km/s. The geomagnetic field was quiet. During the past 24 hours, solar activity was very low. There was one active region on the visible disk, without C-class and above flares produced. The solar wind speed maintained at about 330 km/s. The geomagnetic field was quiet. Within the next three days, solar activity is expected to be very low. The geomagnetic field is expected to be mainly quiet to unsettled and reach isolated active levels on 23 Apr due to the effect of a recurrent coronal hole high speed stream. During last week, solar activity was very low. There was one active region on the visible disk, without C class and above flares produced. The F10.7 index ranged from 69 sfu to 73 sfu. Due to the effect of the recurrent coronal hole high speed stream, the solar wind speed reached the peak of about 620 km/s on 1 Mar and the geomagnetic field was at minor storm for 3 hours, and at active levels for 15 hours on 1 Mar. The greater than 2 MeV electron flux at geosynchronous orbit reached moderate storm levels on 2-3 Mar, and minor storm levels on 4-7 Mar. Within the next week, solar activity is expected to be very low to low. Due to the effect of a recurrent coronal hole high speed stream, the geomagnetic field is expected to reach active levels for 8 Mar and 12-13 Mar. It will be mainly quiet to unsettled for the rest of time. During last week, solar activity was very low to low. 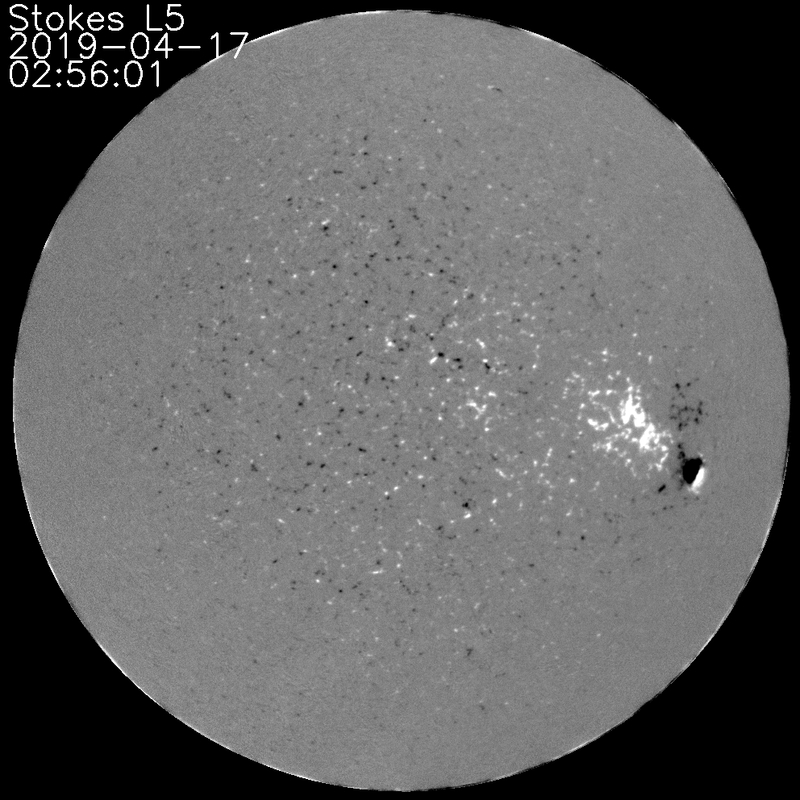 There was one active region on the visible disk, with one C-class flare produced. The F10.7 index ranged from 70 sfu to 72 sfu. 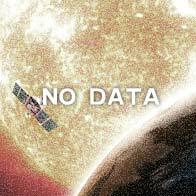 The geomagnetic field was quiet to unsettled. The greater than 2 MeV electron flux at geosynchronous orbit reached minor storm levels on 9-11 Mar. Within the next week, solar activity is expected to be very low. Due to the effect of a recurrent coronal hole high speed stream, the geomagnetic field is expected to reach active levels for 15 Mar and 20 Mar. It will be mainly quiet to unsettled for the rest of time. During last week, solar activity was very low to low. There were two active regions (AR2735 and AR2736) on the visible disk. A C4-class flare associated with a partial CME was produced from AR2736 on 20 Mar. The F10.7 index increased from 70 sfu to 80 sfu. Due to the effect of a recurrent coronal hole high speed stream, the solar wind speed increased to about 460 km/s on 16-17 Mar. The geomagnetic field reached minor storm level for 3 hours and active levels for 9 hours on 16-17 Mar, and quiet to unsettled levels for the rest time. Within the next week, solar activity is expected to be low. The geomagnetic field is expected to reach minor storm levels on 23-24 Mar due to the arrival of CME produced on 20 Mar. Due to the effect of a recurrent coronal hole high speed stream, the geomagnetic field is expected to reach minor storm levels for 27-28 Mar. It will be mainly quiet to unsettled for the rest of time. During last week, solar activity was very low to low. There was one active region (AR2736) on the visible disk. The F10.7 index decreased from 82 sfu to 68 sfu. The geomagnetic field was quiet to unsettled. Within the next week, solar activity is expected to be very low. Due to the effect of a recurrent coronal hole high speed stream, the geomagnetic field is expected to reach active levels on 29 Mar. It will be mainly quiet to unsettled for the rest of time. During last week, solar activity was very low. There was only one active region (AR2737) on the visible disk, without C-class and above flares produced. The F10.7 index ranged from 69 sfu to 71 sfu. Due to the effect of a recurrent coronal hole high speed stream, the solar wind speed reached a peak of 520 km/s. The geomagnetic field reached active level on 31 Mar, 1 Apr and 3 Apr respectively, and was mainly quiet to unsettled for the rest time. Within the next week, solar activity is expected to be very low. Due to the effect of a recurrent coronal hole high speed stream, the geomagnetic field is expected to reach active levels on 5 Apr. It will be mainly quiet to unsettled for the rest of time. During last week, solar activity was very low. There was one active region(AR2738) on the visible disk, without C class and above flares produced. The F10.7 index increased from 72 sfu to 79 sfu. Due to the effect of a recurrent coronal hole high speed stream, the solar wind speed reached the peak of about 530 km/s on 5-6 Apr. Due to another coronal hole high speed stream, the solar wind speed reached the peak of about 480 km/s on 8-10 Apr and the geomagnetic field was at active levels for 12 hours. The greater than 2 MeV electron flux at geosynchronous orbit reached minor storm levels on 5-9 Apr. Within the next week, solar activity is expected to be very low to low. Due to the effect of a coronal hole high speed stream, the geomagnetic field is expected to reach active levels on 12-13 Apr and be mainly quiet to unsettled for the rest of time. 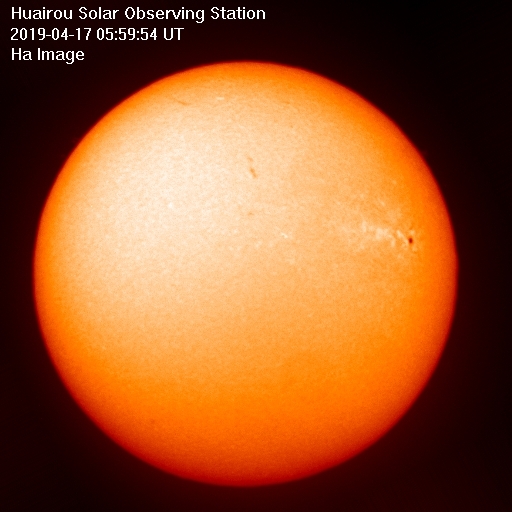 The active region magnetogram is created from the raw full-disk longitudinal magnetogram data, which is observed at Huairou Solar Observatory Station of Beijing in China. This full-disk longitudinal magnetogram is created from the raw data observed by Huairou Solar Observatory Station of Beijing in China.